A great new cuddle toy in the Asthma Friendly line specially designed to go through the process (described on its tag) to reduce allergens. This elephant has polka dots and is 12 inches long. This is my toddlers favorite stuffed animal. It is a nice soft plush that keeps its shape. Has not faded, or become worn after countless washings. The tail has become a chew toy. Very durable, easy to carry around, easy to wash and dry. I have bought a second one in fact, in case we ever lose the first one! This elephant is so cute. It is easy for my daughter to carry her everywhere. Elephant goes everywhere my daughter goes and she can’t sleep without it. I had to buy a second one just in case we forget one at daycare. It has lasted for about 2 years but I can tell elephant is ready to retire. It is machine washable and very soft and cuddly. I bought this elephant, and it is only slightly more than 5 inches long. I am very disappointed. 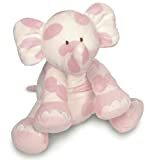 It’s cute, but I was really looking for a bigger plush toy, and the description of how long the elephant measures is wrong.